So, you're not so sure about a mammogram!? We were not too sure the first time either. Yeah Stacey and I have been there before. Now, we are the ones to administer them. I'm a mom and busy with kids too. It is easy to put everyone first, but this is REALLY important! Stacey and I have worked hard to make you feel as comfortable as possible. We have a cute little suite and changing area. You have great privacy. We explain the procedure to make sure you understand how the equipment works. Oh, you heard it is cold!? We use "Bella Blankets" to keep things warm and soft. Seriously, we care about your experience. What's best, we have the best equipment right here in Wahoo! We are so proud! 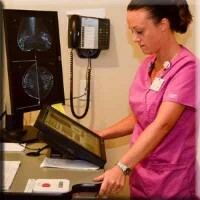 Call us today at 402 443-4191 to schedule your mammograph today—it only takes 15 minutes. And, your loved ones will love that you took time for you!